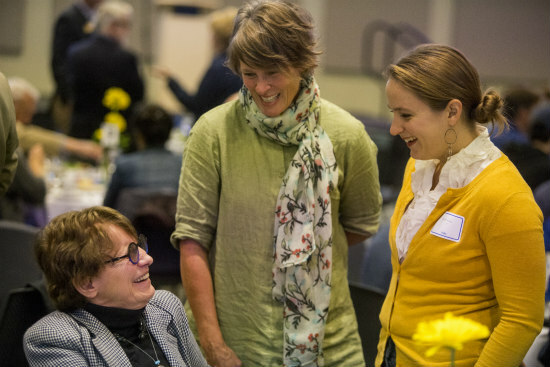 The UMKC College of Arts and Sciences celebrated their scholars and donors at a luncheon that acknowledged the generous donors’ support of students’ consistent hard work through the more than 200 scholarships awarded this year. Dean Wayne Vaught began the ceremony recognizing the college’s accomplishments. Vaught mentioned several of the college’s successes this year including the opening of the new digital history lab in the department of history, which was established with a gift from the William T. Kemper Foundation. Attendees applauded the success of the first graduates of the Propel Program, a comprehensive college experience for young adults with intellectual and developmental disabilities. Vaught highlighted, too, the continued growth of the Department of Communication Studies, including significant studio improvements. “These accomplishments would not be possible without the efforts and talent of our faculty and students, nor would they be possible without the generosity of our donors,” Vaught said. Vaught introduced Chancellor C. Mauli Agrawal, who welcomed the students and commended them for their accomplishments. 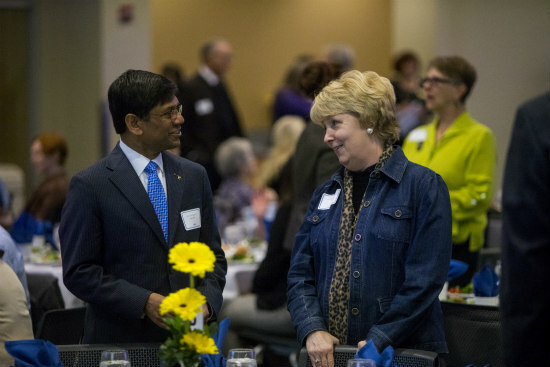 “In many ways, acknowledging student success, expressing appreciation to generous donors and celebrating the interconnections among campus and community that are so vital is the best part of the job for me,” Agrawal said. Agrawal recognized that the relationship between a donor and scholar is significant. “Our donors’ gifts have enormous impact on the lives of deserving young people. Here they get to meet those grateful young people face to face,” he said. While Agrawal noted that he, his wife and his son and daughter are all engineers, they have a deep appreciation for the arts, humanities and other disciplines in the College of Arts and Sciences. Following lunch, Vaught invited the attendees to congratulate the student scholars on their scholarships. Vaught acknowledged, too, the donors and their families. 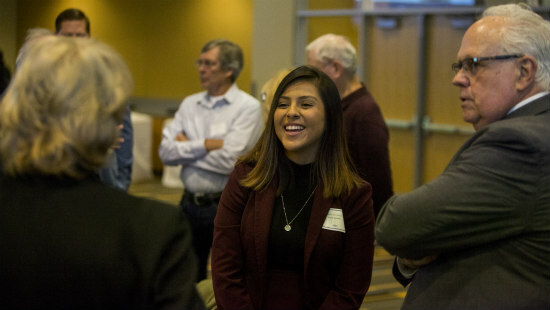 One of the scholarship recipients, Thalia Hernandez, a Bachelor of Arts candidate majoring in economics with a minor in Spanish, expressed her gratitude for scholarship donors. Hernandez realized she was going to have give up her role as president of the UMKC Undergraduate Mock Trail organization — an experience she loved — and scale back to part-time status. “A few weeks before school I received an email informing me that I had received two scholarships,” Hernandez said. “I was overwhelmed by the idea that there were people willing to give up their hard-earned money to help other people succeed. I remembered that this is why I came to UMKC in the first place and I will give back. College of Arts and Sciences alumnus, Bob Carpenter, the play-by-play announcer of the Washington Nationals baseball team, graduated in 1975 with a degree in radio, television and film. He recounted his career path from overnight disc jockey in Jonesboro, Arkansas, to AAA baseball announcer in Tulsa to a stint at ESPN. Carpenter advised students that success is available to them if they are willing to do three things.